Box also has "223 Rem" and "5.56x45mm" on it, please know that this round is loaded to 223 Rem SAMMI specs. 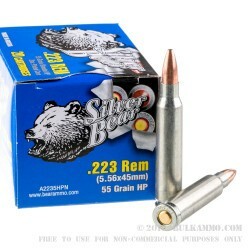 Produced in Barnaul Russia, Silver Bear Ammunition line is well-known for its affordability. Along with its 2 other "Bear" lines of ammo, Brown Bear and Golden Bear, Barnauls’ Silver Bear ammo hit a home run when it came onto the market. The Silver Bear line feature a Zinc Coated case for increased protection of the chamber, increased lubricating properties, and better long-term storage protection from moisture and corrosion. 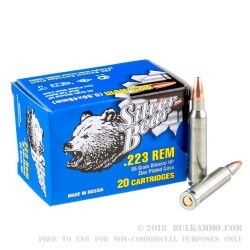 Silver Bear .223 cartridges come topped with 55 grain .223 caliber copper jacketed lead hollow point bullets, with a non-reloadable, Berdan primed, steel case. Hollow point bullets are ideally designed to expand upon impact and cause maximum damage to the animal you are hunting. These rounds come packed tight in boxes of 20, with 25 boxes in the 500 round bulk pack. This package of 500 cartridges is perfect for your safe at home, for a day at the range, to sight in your new red dot, or to take with you to that rifle class you just signed up for. With our bulk pricing, you can easily get one case for home and one for the range. Stock up your armory today. 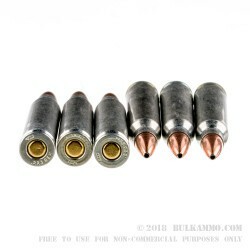 Note: These rounds are loaded to the nationally recognized SAAMI Spec pressure levels. A: Hello Mike, These 55gr. HP rounds by Silver Bear in .223 are non-corrosive. You can shoot them in your firearm without having to worry about corrosive primers. A: Hello, Yes, you can shoot .223 ammo in a firearm chambered in 5.56. 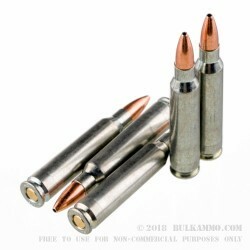 .223 has a lower chamber pressure than 5.56 so it is safe to shoot. You just can't shoot 5.56 in a firearm that's only chambered in .223.